Constructed with Max-R™ recycled plastic lumber, this Single-Sided Message Center is made of the purest grade of Type-2 HDPE recycled plastic in the industry. Double polycarbonate clear doors swing open and closed and can be secured by placing a lock on the stainless steel hasp. 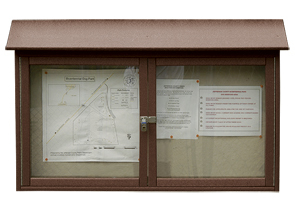 A homasote board for posting comes standard. This Single-Sided Message Center is easy to maintain because of its resistance to insects, mildew, mold, cracking, and graffiti. The recycled plastic will never need paint, and hardware will not rust or corrode. Available in various rich, fade resistant colors shown below. Choose from three different sized message boards to fit your facility's needs. Lock not included.